Astronaut Lisa M. Nowak, STS-121 mission specialist, participates in an exercise in the systems engineering simulator at Johnson Space Center. The facility includes moving scenes of full-sized international space station components over a simulated Earth. CAPE CANAVERAL, Fla. - Two NASA astronauts are poised to make their spaceflight debut this week aboard the space shuttle Discovery, each playing vital roles in what will be the second orbiter flight since the 2003 Columbia accident . Discovery's planned July 1 launch will be a career first for STS-121 mission specialists Lisa Nowak and Stephanie Wilson, who will watch over their spaceflight's robotics and cargo transfer activities during their 12-day trip to the International Space Station (ISS). "It really is good to be back here and doing this for real," Wilson told reporters Tuesday after arriving with here at NASA's Kennedy Space Center with her six STS-121 crewmates. Joining Nowak and Wilson on the rookie list for the STS-121 mission is spacewalker-to-be Michael Fossum , though while he will work outside Discovery, the flight's two female crewmembers will watch over robotic arm operations, heat shield inspections and the ever-critical delivery of thousands of pounds of fresh supplies and equipment for the ISS crew. Despite her rookie status, Nowak has just over 10 years of NASA service under her belt since her selection to join astronaut corps in April 1996. "Rookies aren't what they used to be," said Nowak, 43, in a preflight interview. "Everybody is called a rookie on the first time, but people have been here going on 10 years and we've done a lot in a lot of different areas." A native of Washington , D.C. , Nowak joined the U.S. Navy in 1985 and earned her flight wings two years later after a six-month stint on temporary duty at NASA's Johnson Space Center in Houston , Texas . Now a U.S. Navy commander, Nowak has performed in a number of positions within the Astronaut Office at JSC, where she took on technical duties in operations planning, joined the robotics branch and served as a spacecraft communicator to astronauts in Earth orbit. "Any one of those jobs by themselves are things that people stand in line for," Nowak said. "So being able to go on a mission...is definitely worth the wait." An avid rubber stamp collector, Nowak has three children - two young daughters and a 14-year-old son - with husband Richard, and has taken great care to go over the risks of human spaceflight with her loved ones. That effort, Nowak said, has won strong support from her family. "I remember the day of the Columbia accident," Nowak said. "My son was there with me. He reached over and held my hand and said, 'Mom, I know this is tough, but I still want you to go.'" As Mission Specialist 2, Nowak's primary job during the STS-121 mission will be to guide the robotic arms aboard Discovery and the ISS during spacewalks and other mission tasks. Among those chores is the crucial inspection of Discovery's heat shield using a 50-foot (15-meter), sensor-laden boom extending from the orbiter's robotic arm. "A lot of it is an automated sequence," Nowak said of the inspection, adding that she must be careful not to get bored or complacent during the process. "It's kind of like driving a car. If you're tired, it can be easy to let something happen if you're not watching very carefully." Nowak said that despite the busy flight, she hopes to rise to the challenge of her first flight. "My number one goal is to get through all my tasks and assignments quickly and efficiently," she said. As STS-121's Mission Specialist 3, Wilson has her work cut out for her. The first-time flyer will oversee the delivery of more than 5,000 pounds (2,267 kilograms) of new equipment, cargo and food for ISS astronauts. Wilson will also split robotic arm responsibilities with Nowak. "This has been a dream of mine for a long time," Wilson , 39, said. "Personally, I hope to have a chance to just enjoy the moment and enjoy being in space." Hailing from Pittsfield , Massachusetts , Wilson holds degrees in engineering science from Harvard University , and aerospace engineering from the University of Texas , and joined NASA long before making it into the agency's astronaut ranks in 1996. She worked at NASA's Jet Propulsion Laboratory (JPL) in Pasadena , California for four years to support the space agency's Galileo mission to Jupiter, and later its Interferometry Technology Program. But it took two applications to make it into NASA's astronaut circles. "So that was all, for me, a natural progression from working on launch vehicles and robotic spacecraft to now flying on the shuttle," Wilson said in a NASA interview. Like Nowak, Wilson collects stamps, though hers are of the postage variety rather than rubber. 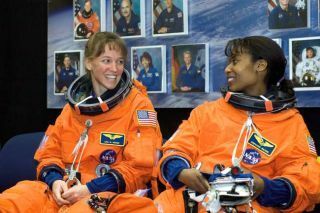 "It's nice to have another woman on the flight," Wilson said of her fellow STS-121 astronaut. Wilson said that she and her family are aware of the risks involved with Discovery's STS-121 launch, and that she has worked hard to answer their questions about the redesigns included in the upcoming launch. "I have tried to live my life so that I have always been able to do the things I want to do and see the places I wanted," Wilson said. "I'm very much looking forward to getting the [space] station the items that they need." Robert Z. Pearlman, of SPACE.com partner collectSPACE.com , contributed to this story.